OK, I go back to tipping from tip as that is the improssion I get from your decription, but I am clearer on your concept and don't disagree since we are really saying very simialr things. I will still say you don't need to tip a fat ski that much in pow or broken but fully agree its not the right tool for firm groomed. even in tight trees, I rarely need to make a tight turn that a good use of flexon and extension can't overcome with near flat ski's. - HH actually uses this on the 2 footed release drills I beleive they are called. ?a fall-line srt is a different animal... ? Excellent explantion and I would concur on all counts....brushed turns are an effective tool to use. Turning from the center of the ski too means to me that as I stand centered and stacked over my skis and in my frame, all the functions of my foot work tell the skis what to do. The degree of ptich, the snow conditions, my fore and afte position, how my center of mass works above the ski, all are participants in how the skis function benath me. AND all of this for me is triggered by the pole touch. So whether the ski turn begins somewhere near the front of the ski, the center of the ski or off the back end of the ski, it's the feet, foe and aft body position and and how the center of mass is movoing into the next turn that shape the turn. If your skiing All Mountain....you for sure have of many ways you shape your turns....the turns may all start the same through a release of the edges but what happens after that is what makes the skier look fluid and smooth...ah yes....the happy skier! Must make it to MT....gotta get us together JB! ? OK, now that the three of you have it sorted it out, allow me to jump in here like I know what the heck I am talking about. (recognize that all three of you are better skiers that I am). There are only two ways to redirect a ski. 2. Just rotate the skis into the direction you want to go. 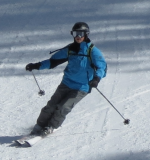 In a different category are moves that allow a ski to drift/brush/displace sideways without actually redirecting or changing the heading of the ski. How does a ski decamber? 1. By tipping the ski until the sidecut causes the tip to engage on a relatively firm surface. 2. In soft snow, the force of the snow in front of the ski keeps it decambered most of the time. How does a ski rotate? 2. pivoting - where the edge is not engaged, and the ski can be spun on its vertical axis. 3. frudding - forward skidding, where the tail stays relatively fixed and the tips are displaced UP the hill??? ? How much force is required to decamber the ski?? Depends on the sidecut and stiffness of the ski. 1. A deeper sidecut will engage earlier on a firm surface and create earlier/more decambering forces. 2. A wider ski forebody will encounter more snow resistance and create more decambering force. 3. A stiffer ski will resist both of these decambering forces.? (think race slalom or big mountain planks for doing first descents). 4. A softer ski will allow itself to be decambered more easily. (think Head iC160 or the Salomon Pocket Rocket). I think we are all finally in agreement!! I feel like I just pounded a nail in the coffin of this thread. I was trying to be funny and created the Reader's Digest simplified version of the Ron/JBotti/Gary thread. Oh well, I should have new skis to drool over next week. Hey, if you can't ski you might as well talk about skiing!! That's what this and other like forums are for. I can pat myself on th ebcak this year because I have not gone out and bought a bunnch of new skis as I seem to do every year at this time. I did buy the Head I Speeds but some sort of cheater GS skis was already on my need list after my broter essentially stole my Progressors. News from Lovelend is that they are making snow every night but it iis also still egtting very warm each day. We are in a heat wave on the west coast with temps in the 100's in So cal and upper 90's and into the 100's in some parts of the bay area. In another week or two, fall will truly set in. Loooking forward to demoing the Chariots. Question number 2.? How many pair of skis total (all models) do you think their business model would consider "break even" and how many would make a "good year" for a 1st year startup like Ski Logik.? I was quite surprised by them saying they had to cut up 1000's of pair of skis when he was running Scotty Bob.? That was 3-4 times what I assumed a full year's production was.? If you had to WAG a number, how many pair of Kastle's were sold last year. Ron, do you have any idea how many pair Icelantic is now selling per year?? They have a lot more name recognition and acceptance than ski-logik. One of JBotti's orignal assessments characterizations of the Ullr's Chariot was that it would "ski short". What does that term mean? --- especially when the reviews (not that many) emphasize the stability of the UC in lots of different surface conditions? Stability is often one of the things that is gained by going to a longer ski, short turns from a shorter ski (slalom vs. gs for example). More total surface area and therefore more float would be another thing gained from a longer ski? I know when I rented Mojo 90's in Park City a couple of years ago, I didn't like the way they felt; they looked short because of where the bindings were mounted, but now that I think about it they didn't really feel short, they just felt unstable and not balanced right. And I don't even remember their length. Ski's skiing short just means the perceived length is shorter than the length would dictate. Some times the stated length is longer than it really is. this is especailly true with long tapered skis or skis with a lot of rise on the rocker. I think that co's like PM Gear (makers of the Bro Models) and DPS a few years ago were selling between 500 and 1000 pairs of skis total in a season. They both may be a lot bigger today, but I doubt they are selling more than 2000 pairs of skis each (I could be wrong). If we assume that that the average sale prce per ski is $800 then at 500 skis they have gross revenue of $400k and at 1000 skis they have gross revenue of $800k. Generally the big guys (head fisher Atomic Etc) have roughly 40% GM on their skis which they sell at about a 50% discount from MSRP to the dealers (PHil can help here). This implies that cost to build a $1000 retail ski is $300. These companies have economies of scale, but many manufacture in high cost areas like Europe and not China (K2 does everything in China). DPS is doing all manufacturing in China. My guess is that in China you can build a ski for $250-300 in lower volume (500-1000 units). Assuming that cost then at $800 Gross profit for every ski is $525 x 500 = 262,500 and X 1000 = $525,000. From there we can guesstimate what the other costs of the business are. My guess is that many of ?these business are around break even at 500 skis. At 1000 they make some money. I would say this is true for all the garage companies. Once they start spending more for marketing and or distribution and start adding head count, that profit can disappear quickly. My guess is that if Dave sold 1000 skis this year he would makes some decent profits and he would be quite happy. Phil may be right that if he sells 150 he may be lucky. Wow, if Kastle with all their buzz sold only 600 pairs of skis that tells you something. Phil was that in the US or Worldwide? No way they are profitable on that. They have high manufacturing costs, superior quality control and they are not a garage company. My guess would be that they can easily double that this year. It would be interesting to know how many skis Stockli is selling per year. Tough business!! Wow, if Kastle with all their buzz sold only 600 pairs of skis that tells you something. Phil was that in the US or Worldwide? I think that was US, wolrd wide was not that much more.